FirstEnergy says a proposed deal between its regulated Ohio utilities and their unregulated generation affiliate would create a windfall for ratepayers. However, the utility has been opaque about releasing information that could shed light on this claim. Meanwhile, environmental and consumer advocates continue to criticize the proposal as a “bailout” for aging power plants that can’t compete on the free market, undermining competition at ratepayers’ expense. FirstEnergy wants the Public Utilities Commission of Ohio (PUCO) to approve a power purchase agreement between its regulated Ohio distribution utilities and their unregulated generation affiliate, FirstEnergy Solutions. Under the agreement, the utilities would buy all the electricity from certain plants. The 15-year contract would cover the W.H. Sammis coal plant in Stratton, Ohio, which began operations in 1959, as well as the 36-year-old Davis-Besse nuclear plant in Oak Harbor, Ohio. The plan would also cover FirstEnergy’s share of two 1950s-era coal plants owned by the Ohio Valley Electric Corporation. “All told it’s about 3,200 megawatts of load,” said FirstEnergy spokesperson Doug Colafella. FirstEnergy Solutions’ total generating capacity is roughly 14,000 megawatts. Any difference between the plan’s contract price and the competitive market price would show up on customer bills. Any charge or potential credit would apply to all distribution customers, including “shopping” customers who buy their electricity from another company. FirstEnergy says the “Powering Ohio’s Progress” plan would provide a hedge against rising electric prices. The company also says the plan would ensure reliability by keeping large coal and nuclear plants in Ohio open. Its press materials say the plants provide $1 billion in statewide economic benefits with 3,000 direct and indirect jobs. Also, “it benefits [FirstEnergy Solutions] by providing a top base source of revenue for approximately 25 percent of its generation output,” Leila Vespoli, FirstEnergy’s Executive Vice President and Chief Legal Officer, said one day after the PUCO filing. The plan comes 15 years after Ohio Senate Bill 3 began deregulation of the electricity supply industry in the state. The law mandated separation of utilities’ distribution businesses from their generation businesses. In the interests of rate stability, terms in PUCO-approved “electric security plans” favored utility-owned generation for several years after the transition took place. FirstEnergy completed the process about six years ago. “FirstEnergy put in about a decade of work to successfully realign our business around the competitive model,” Colafella said last year. “Admittedly we fought it when the law first passed, but we took difficult steps,” he added. 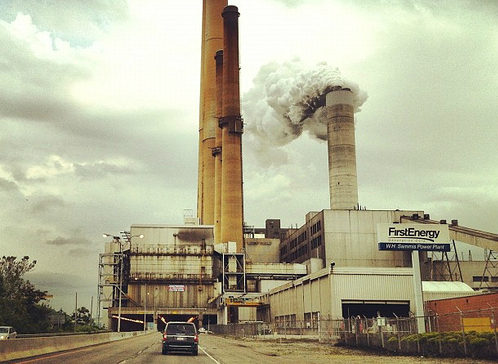 FirstEnergy insists its new plan does not undo the separation required by Ohio law. Yet whether they shop or not, customers will pay based on how the coal and nuclear plants covered by the plan perform. “If it turns out that the proposal FirstEnergy is presenting is not superior to the market and would cost money instead of save money, then not only will it be opposed on factual grounds, but it will be challenged legally,” said Sam Randazzo, an attorney for Industrial Energy Users—Ohio (IEU). IEU has moved to intervene in FirstEnergy’s case. However, Randazzo said the group wants to review all the data before deciding if it will oppose the new plan. In another case, IEU has objected to a similar plan proposed by American Electric Power (AEP). “There’s a whole bunch of issues that customers would be on the hook and paying for,” said Dan Sawmiller of the Sierra Club’s Beyond Coal program. These include costs to comply with the Environmental Protection Agency’s carbon pollution standards, Sawmiller says. There would likely be expenses for other environmental laws, as well as plant upgrades. The coal plants covered by the plan are all over 50 years old. The average age for a coal plant in the U.S. is 42 years. Verifying FirstEnergy’s claims is complicated by the fact that the company has asserted a confidentiality claim for some of the data and testimony it filed with the PUCO. Critics also say the plan runs counter to the spirit of deregulation and free market competition for electricity generation. “If FirstEnergy Solutions was able to sell this generation capacity at a profit on the open market, they wouldn’t be asking for customers to bail these facilities out,” Sawmiller noted. Grid operator PJM holds capacity auctions each year to make sure there is enough generating capability to meet projected needs three years into the future. “The whole point of a capacity auction is making sure that those facilities have their costs covered three years down the road so they can remain open,” Colafella explained this spring. FirstEnergy won’t confirm or deny whether it sold all the capacity for its Ohio plants in the most recent auction in May. “We don’t disclose what cleared and what didn’t clear,” Colafella said. However, that’s not true for all of FirstEnergy’s plants. Any costs not covered by capacity payments could presumably be built into the price for a plant’s output and make its electricity more expensive. Even if a plant cleared the capacity auction, operating costs could still drive its prices higher than competitive sources from newer plants, natural gas, or renewable energy. Either way, FirstEnergy’s plan presumably builds anticipated costs into the contract price for the covered plants’ electricity. And the plan would pass any difference between that price and the prevailing market price on to all customers, whether they chose FirstEnergy for their supplier or not. Last week the Ohio chapter of the Sierra Club launched its “No Coal Bailouts” campaign against FirstEnergy’s plan and similar ones proposed by AEP and Duke Energy. The Sierra Club campaign includes street kiosks, online ads, and web-based animations. “There are a lot of reasons to love Ohio,” says a kiosk ad. “Coal pollution isn’t one of them.” The Sierra Club also delivered 1,500 signatures against power purchase plans to the PUCO. AEP has moved to intervene in the new FirstEnergy case. Presumably that’s because AEP wants its own proposed plan approved too. AEP and FirstEnergy have not always been aligned before the PUCO, however. Last year, FirstEnergy argued that two cases were improper attempts by AEP to get a competitive advantage over suppliers. In one case, FirstEnergy successful argued against letting AEP charge customers for building the 50 megawatt Turning Point solar energy project near Zanesville, Ohio. Also in 2013, FirstEnergy fought against terms in AEP’s proposed rate plan that would provide financial support for AEP’s generation facilities. Last month FirstEnergy withdrew from the case, although the appeals by other parties continue before the Ohio Supreme Court. “Competitive markets work very well when they’re permitted to operate on a level field without subsidies or barriers to entry into the market,” the FirstEnergy spokesperson added.